Used as a soil amendment and fertilizer, Jersey Greensand is mined from deposits of minerals that were originally part of the ocean floor. 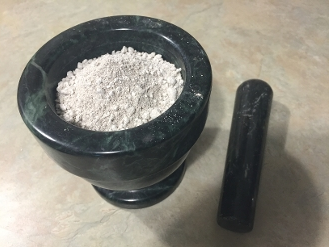 Contains about 3% total potash, along with iron, magnesium, silica and as many as 30 other trace minerals. May also be used to loosen heavy soils. Important exposures are known from both northern and western Europe, North America, and north Africa. Well known and important greensands are the Upper and Lower Greensands of England and occur within Eocene and Cretaceous sedimentary strata underlying the coastal plains of New Jersey and Delaware. 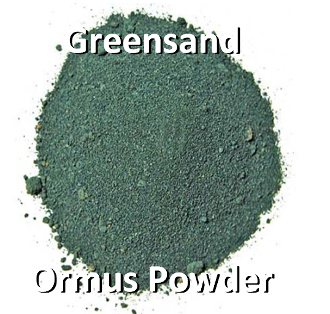 Although greensand has been found throughout Phanerozoic and Late Precambrian sedimentary deposits, it appears to be most common in Eocene, Cambrian, and Cretaceous sedimentary deposits for unknown reasons.